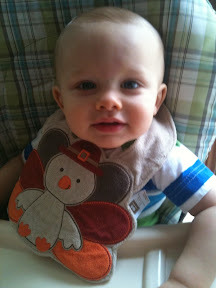 Today was Tristan's first Thanksgiving. 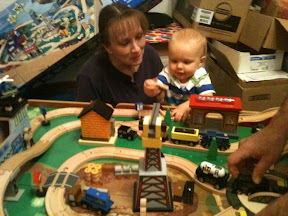 While I helped mom cook, my Dad, Bub and Chelle put together the train table mom bought for Tristan and future grandkids. 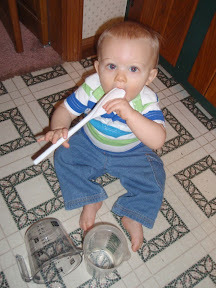 Tristan played in the floor with the measuring cups and a spoon until dinner time. Dinner was great! My mom is the best cook ever! We had turkey and ham (I don't like turkey), potato casserole, broccoli casserole, mashed potatoes (for my dad), dressing, deviled eggs, and two kids of rolls. 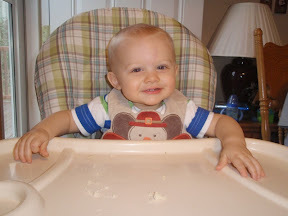 Tristan had his first full meal of grown up food: 2 rolls (the child loves bread), broccoli, mashed potatoes and potato casserole! 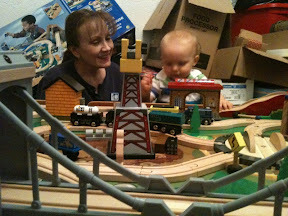 After dinner and the clean up we took him in to see the train table. He loved it! He played with it a lot more than any of us thought he would being so young. Then we went to Kim's to hang out with Tyler's family. 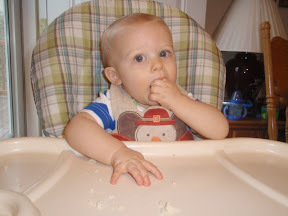 Tristan ate some of Mim's rolls, I'm telling you the kid loves bread, some graham cracker crust and some whipped cream. He played until he couldn't take it anymore and then I brought him home to bed. I also got to talk to Tyler today. He said the meal was unbelievable. He said they had every dish you could ever imagine and that the food made cruise food (his standard) seem like Shoney's. In the chow hall were ice sculptures, but that wasn't the best part. They had taken sandbags and built them up and covered them with a tarp full of water and had an actual floating model of the Mayflower! I should mention that the food was prepared by Kuwaiti nationals. Tyler said the coolest part was that the Generals, Colonels and Sergeant Majors served them, as it is an Army tradition. It seems like he had a great Thanksgiving, too.